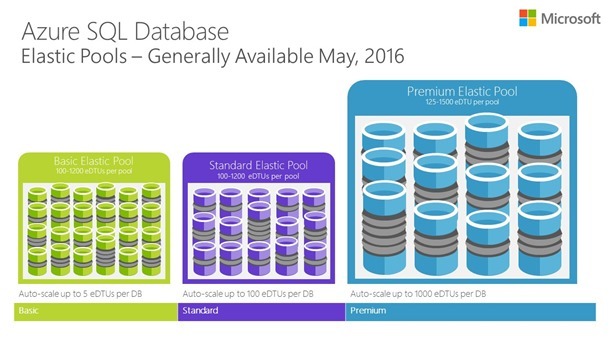 We're excited to announce Azure SQL Database elastic pools are now generally available. Since previewing elastic pools last year, we have seen a tremendous number of SaaS and enterprise developers leveraging elastic pools to efficiently manage a growing number of cloud databases and apps. Elastic pools are ideally suited for SaaS and line-of-business applications that need the performance, availability, and security isolation benefits provided by provisioning one database for each tenant or application. Each elastic database in the pool gets the resources it needs when it needs it, and eliminates the complexity of managing the performance of individual databases. Elastic pools provide the best price performance for a group of databases within a prescribed budget while delivering performance elasticity for each database. Auto-scaling you control. Pools automatically scale performance and storage capacity for elastic databases on the fly. You can control the performance assigned to a pool, add or remove elastic databases on demand, and define performance of elastic databases without affecting the overall cost of the pool. This means you don’t have to worry about managing the usage of individual databases. See elastic pool guidance for details. Intelligent management of your environment. Built-in sizing recommendations proactively identify databases that would benefit from pools. These recommendations allow “what-if” analysis for quick optimization to meet your performance goals. Rich performance monitoring and troubleshooting dashboards help you visualize historical pool utilization. Check out the Monitor, manage, and size an elastic pool documentation article for details. Performance and price to meet your needs. Basic, standard, and premium pools provide you a broad spectrum of performance, storage and pricing options. Pools can contain up to 400 elastic databases. Elastic databases can auto-scale up to 1000 elastic database transaction units (eDTU). See SQL Database pricing for details. “We’ve migrated +800 of our databases to elastic pools. Each are grouped into a mixture of standard and premium elastic pools which allow us to offer tiered performance and pricing options to our customers. Since the migration, we’ve closed two datacenters in San Jose, CA and Newark, NJ and we’re proud to say GEP is now a datacenter free company. SQL Database brings huge cost savings to us in long run - in the 2016 financial year alone, the adoption of elastic pools will save us a quarter of a million dollars,” says Dhananjay Nagalkar, vice president of technology at GEP. GEP is a technology provider of SMART by GEP, a cloud-based procurement and supply chain solutions. Perform cross-database queries and reporting. Elastic database query enables you to run queries or reports across databases in your elastic pool and access remote data stored in many databases of your pool at once. Run cross database transactions. Elastic database transactions allow you to run transactions that span several databases in SQL Databases such and perform operations such as when processing financial transactions across databases, or when updating inventory in one database and orders in another. Execute the same operations on several databases. Elastic database jobs execute administrative operations such as rebuilding indexes or updating schemas across each database in your elastic pool. “Elastic pools are a really great fit for Umbraco as a Service. We can easily scale the amount of eDTUs available for a pool when the need arises, and we can set up alerts to help us monitor resource utilization for both the pool itself as well as the databases from various tenants. The flexibility we get with setting min and max performance of over 3400 databases across the 20 elastic pools we manage is really nice. It helps eliminate the noisy neighbor syndrome for our customers and enables our customers’ usage of their databases to spike every once in a while and not be limited to a fixed eDTU utilization. The price point is very attractive; it enables us to run multiple databases per customer, which is essential to our SaaS offering,” says Morten Christensen, tech lead for Umbraco as a Service. Watch the short video on how to create an elastic pool. Explore Azure SQL Database pricing to understand the spectrum of performance and pricing options available. Read the overview of elastic pools.